Well. Yes, and no. I just finished testing it with 2kg/s. And strange things start to happen when flow rate gets below 5kg/s... well, actually don't really know when it starts acting weird but somewhere between 5kg/s and 2kg/s. At 2kg/s the heat exchanger becomes heavily biased at heating up the cold liquid with amazing efficiency. Just staggeringly good efficiency but at the same time cooling down the hot liquid is atrociously bad. I wonder if the HC part of this equation starts mucking things up; and the fact that buildings (including pipes) have 1/5th of the HC they should have. I tested these. If you consider their buffering ability, they're pretty good. 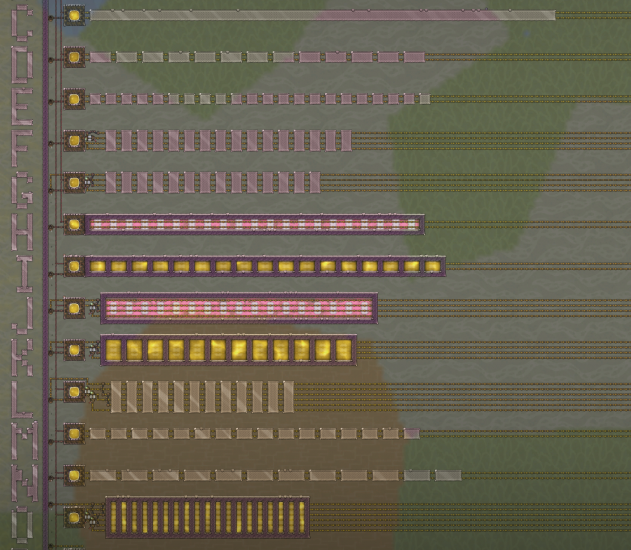 A is 94 wide, diamond,with water (well in this case steam) in the middle. B is the same but with gold tiles, 5 wider. We've already established that pipes directly in liquid in a stacked heat exchanger is by far the best option possible even with very cheap materials used. So maybe we should concentrate on finding the best lay-out for that. Like what is the optimum length of each step? 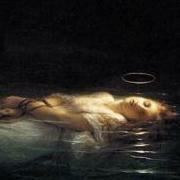 Is there a point of no meaningful return? Such questions are important as I don't think many cares that much about 240W extra power use with that level of efficiency improvement. Like what is the optimum length of each step? 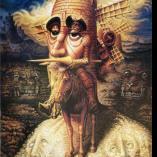 Is there a point of no meaningful return? I'll play with those, but I'm not a huge fan of the open design. It limits you in several ways, the most important one being is that it doesn't work without po2 production if the open liquid is pwater. You can overpressurize the room with a somewhat thermally neutral gas like co2 or chlorine, but you'll still get vacuum bubbles as the liquid goes down the ladder where po2 will form. My other main gripe is that if you have intermittent supply where the two liquids aren't even flowing simultaneously, it provides no buffering, unlike the design above. I any case, I tested some more designs, including your split flow variations. It's somewhat pointless to score these as the metal used varies greatly, independent of width. C is just a big block of thermium. D is a series of 4-wide thermium blocks. F 2x4 blocks, with the flow split 50/50. Petroleum is in the top 2 lines. G same as F but with the hot/cold flows interleaved. H hydrogen and diamond tempshift plates. The cheapest build here by far. I petroleum with diamond tempshift plates. Second cheapest, and very solid buffering ability. Should be OK with ceramics too, probably needs an extra chamber for 90% then. J Same as H but flow split and interleaved. K Same as I but with flow split and interleaved. L flow split into 3333g/sec packets, interleaved. O Petrol, diamond tempshift plates. Flow split into 3333g/sec, interleaved. This absolutely does not work if the insulation is not insulation; the others should be fine with ceramics at minimal efficiency loss. Right. So I made a short test with a ladder. I used sandstone tiles and just gold pipes, and yet the result is just mind numbingly good for the minimum effort. As far as these open designs go, there's not a lot of difference between them as long as the layout is somewhat reasonable. All these have 40 tiles of active pipe in contact with the liquid. The only real outlier is N.
They get better the taller they are (Except H and M should be reversed; beats me.) The reason for taller=better probably the liquid being super goopy, and "bunching" up after landing, then spreading out very slowly. The less ability the liquid has to spread out, the better its distribution. N constantly has 150kg+ petroleum under the vent and after the drop. M has under 30. Like what is the optimum length of each step? I consider an short length per independent step more desirable, so I am able to "pause/stop" the build for some time. => All designs with a way to equalize the temperature without a liquid flow would be bad for non continuous operation. Thank you for testing biopon. I thought a bit about the accessibility, so i suggested more diamond. => Thermium tiles in a ring with a thermium tempshift plate should perform much better. PS: Since the last update my game crahes without any specific intercations so can´t test it myself. Maybe someone else would be in the mood to run the test map again with the 2 suggested ideas. @biopon Liquids are biased toward flowing right, so a folded design is made for space saving. For test however we should consider ladders. I found a profound difference in designs where the flow is right to left instead of left to right. But I think we can safely conclude the pipe in liquid is still as previous tests have shown by far the superior heat exchanger design. Nothing else comes even remotely close as we can get almost the same efficiency with regular materials compared to other designs which uses exotic or even space age materials. You can also build in quite considerable thermal buffering by using regular tiles, or metal tiles, instead of insulated tiles in a ladder design as each step is not directly connected with the one above or below. You can even have a roof over the ladder design for even further thermal buffering should it be needed. Ok. Did a round of testing with ladders. 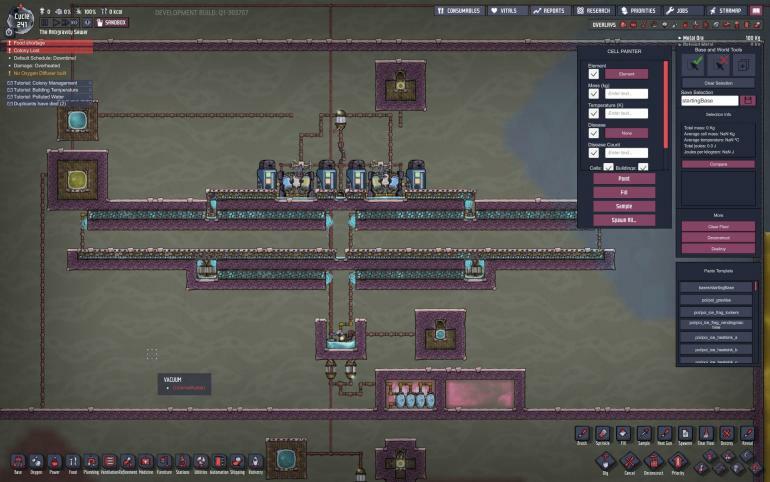 For this test I used water flow at 5000g/s. Hot water is 80C exactly. Cold water is 20C exactly. I used water because I wanted to have the same specific heat capacity. I used 5kg/s flow because it magnifies the results without the added weirdness at very low flow rates. 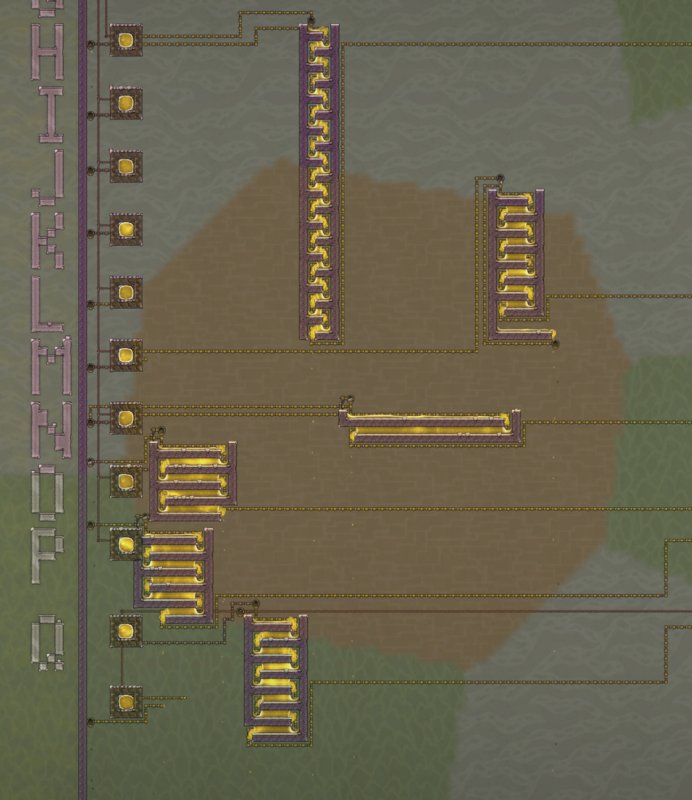 I set up 4 different 24 tile wide ladders with incremental steeping. And 2 buffered ladders of the same length where the pipe is snaked inside the metal tiles as well. 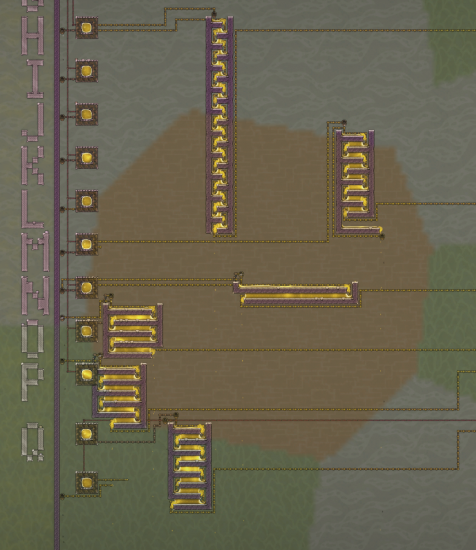 I set up the ladders for flow in both directions. And I ran two runs. One with hot open flow and cold pipes. And one with cold open flow and hot pipes. Materials are gold pipes, ceramic tiles, and gold tiles. L-pipe is the length of active pipe in either liquid or tiles. 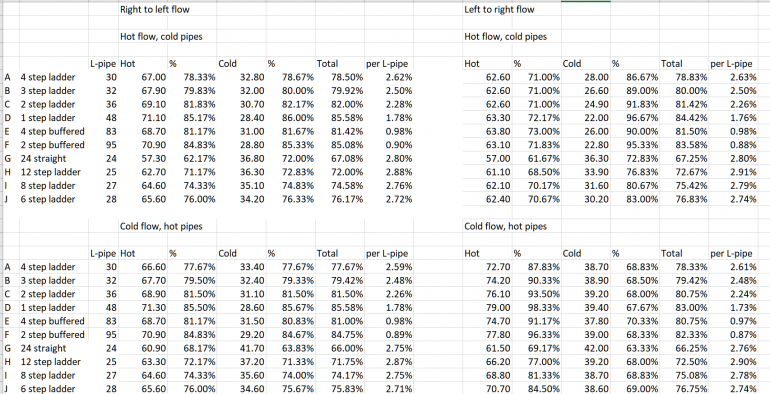 As can be noted, as soon as pipes in tiles are used efficiency per pipe section used drops like a rock. Can you make an interpretation of theses results please ? I'm interested but I fear that I might miss some nice conclusions. It seems that left to right exchange temp better. But for example in case A, left ro right and cold flow hot pipes : How can you have hot water leaving at 72.70 and cold at 38.70 ? It's 8 degrees less for hot and 18 degrees more for cold water ? How is that possible ? I mentioned it earlier. I you have a tank of water where the top layer isn't filled completely there will be more water in the rightmost tile than in the leftmost tile. So the ladder traps more water on each step when the water is flowing right to left than the opposite direction creating some huge differences. 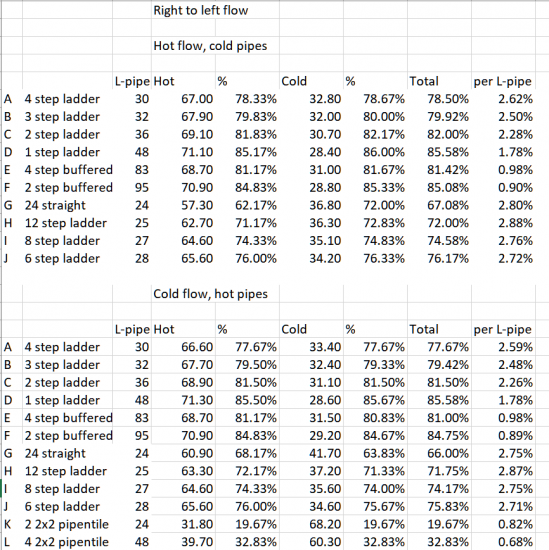 I'll reserve conclusions as I want to make a few more tests with some additional set up but preliminary we can see that right to left flow gives the most balanced results where left to right flow gives quite large differences in the efficiency in each direction. Overall the total efficiencies are about the same. For now I'd say to just look at the "per L-pipe" numbers as that is the most "bang for your buck" result in terms of overall area used and material cost. To me the most surprising result is that the longer the steps are the more efficient it is when the overall area used and material cost is considered. As I originally thought the shortest possible steps, ie. the 45 degree slope, would have been the best. That's also why I want to make a few more tests with longer steps with 6, 8, 12, and just 24 straight length to see if there's a tipping point where step length is optimal. Back with another round with longer steps. Same test methodology as before. So conclusion time. It's pretty obvious that the optimum step length is somewhere between 8 wide and 24 wide steps. 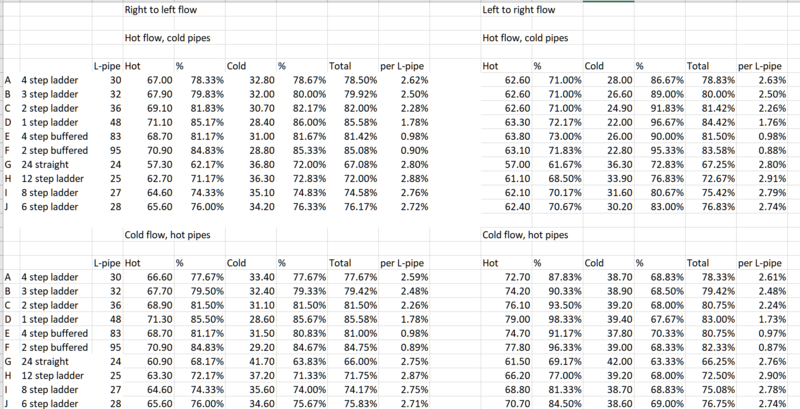 At 12 wide steps the efficiency per pipe segment used is the highest in my test but I think the optimum length is probably around 15-16 wide steps which by coincidence is also the the step length I have intuitively built such heat exchangers in the past. If you want a skewed result for example if you're making an oil cooker and want to remedy the difference in specific heat capacity of crude and petrol then left to right flow is definitely the preferred option. If you want a balanced result where the hot side is cooled as much as the cold side is heated then you should definitely go with right to left flow. To me the most surprising result is that the longer the steps are the more efficient it is when the overall area used and material cost is considered. As I originally thought the shortest possible steps, ie. the 45 degree slope, would have been the best. Is it that surprising? In the 45 degree slope the liquid is technically in a falling state for 50% of the time. All of the floating "elbows" are essentially wasted as far as I can see. In terms of material cost the steeper the slope, the more pipe is wasted if you have all those floating elbows as shown below. Would be cheaper to hide those pieces within the insulated tiles using some cheap insulated piping as they'll offer nothing to heat transfer as far as I've observed. All of the floating "elbows" are essentially wasted as far as I can see..
Nope. The "elbow" is submerged. That is also why it's surprising that the 45 degree slope is so bad. But this tile has 1kg of water in it ? Shouldn't it have 5kg ? I'm sorry I didn't catch this earlier but you did mean the most expensive of all builds, not cheapest, right? A temp shift plate is 800kg each. That's enough for 8 window tiles so with the same amount of material used in H you could make a heat exchanger with 2x2 blocks of window tiles over twice the length of the E option. We often forget just how ridiculously expensive in material costs temp shift plates are. 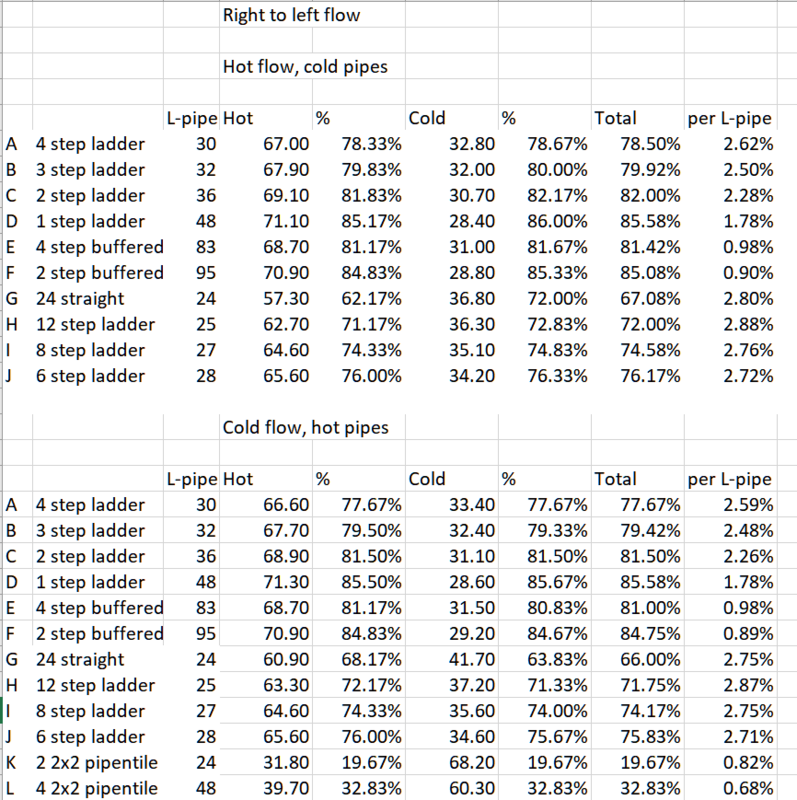 Just to compare the open ladder heat exchanger with pipe'n'tile heat exchangers in material costs versus efficiency. I took the metal cost of the least and the most costly open ladder heat exchangers from earlier. 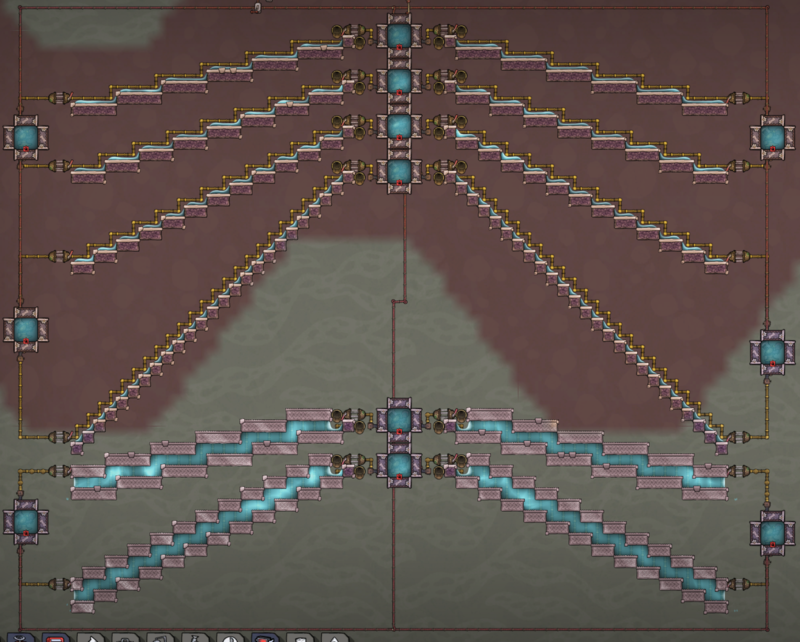 And made a 2x2 pipe'n'tile exchanger with the exact same amount of active metal used, not even counting the connecting pipes between the blocks. And this is what it looks like. Here the results with the others. They're called K and L at the bottom. Maybe I integrate one of those in my next base. It converts 23,8C polluted water to 23,7C water in an 1:1 ratio and can thus be used as an toilet aquatuner design. The precolling of the pH20 is probably not necessary due to natural occuring thermal losses and the fact that the 1:1 ratio is not necessary. Maybe I integrate one of those in my next base. A suggestion. Remove the mesh tiles. In terms of thermium, those are the least expensive by far. Diamond is rather plentiful and I always end up having more of it than I can ever use. Fantastic work on those ladders by the way. I meant the surface water. 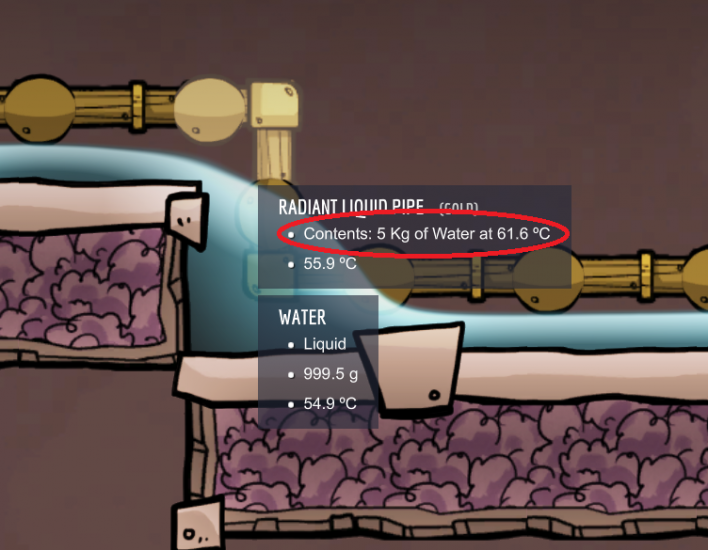 If you're pumping at a rate of 5kg/s - why is the water at only 999.5g. It's one of the quirks of the open flow design. The open liquid will be distributed unevenly. The tile below that 999.5g water has a lot more, then it has less and less as it spreads out to the right. Then it drops, bunches up again, then flattens out, etc. This doesn't seem to have an effect on efficiency however. Well, maybe it does, but the reduced number of steps the heat exchange must go through more than make up for it. I'm not quite sure what the problem is. The static amount isn't the important part. There is some effect of how much water is trapped in a spot naturally but the important part is that there is some water at all. Because if there is some water permanently in a tile then that means 5kg/s water flows through that tile regardless of the actual static amount. You can't measure the current of a river by measuring the depth or width of it.